From A Coded World functioned directly within the neighbourhood of Perivale, West London within which its audience lived. It was directed at engaging this audience in re-thinking their perceptions about their own community and environment and transforming their wider perceptions about society and its values. It raised awareness of how diverse other people’s views were, even within the same neighbourhood and community. The work was carried out in a specific part of Perivale as it was fairly self-contained, somewhat isolated from surrounding neighbourhoods and reasonably socially consistent being made up of 1930’s suburban housing. Over a period of four weeks, a series of twelve Problem Display Boards were located in gardens and focal points in the area. 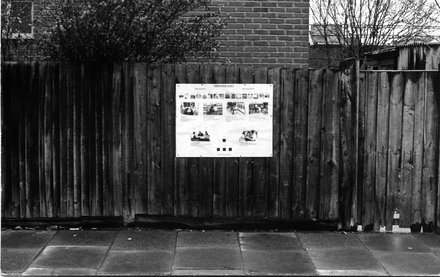 The boards were made up of photos and texts showing images from the area and couples in two familiar situations – firstly in a domestic situation associated with an interpersonal role and then as members of a working environment. Each presented a question to the audience concerning different ways of decision-making within society, so that the first Board looked at authoritative decision-making models and then moved on through other models such as consultative and co-operative. 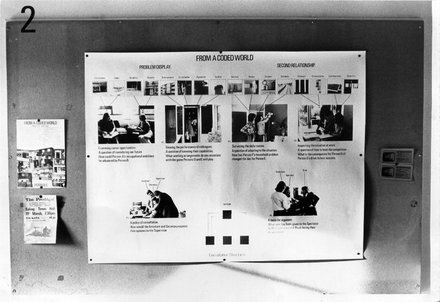 The boards were changed at the end of every week to present fresh problems connected to an evermore mutualistic view of society. 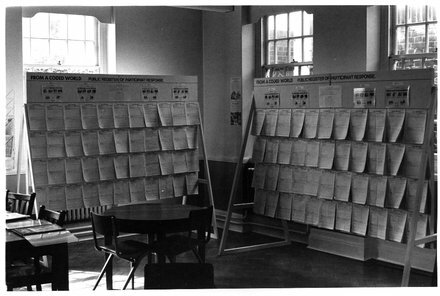 Responses to each Problem Display were collected weekly by Project Operators and all displayed on a register in Perivale Library so that everyone could see and compare all the responses.